However, one item I splurged on for Christmas of 2011 was a Keurig for my coffee drinking husband. Before that year I had never understood what the big deal about kcups was all about. To me Keurig represented luxury and elegance and the opposite of my frugal lifestyle. 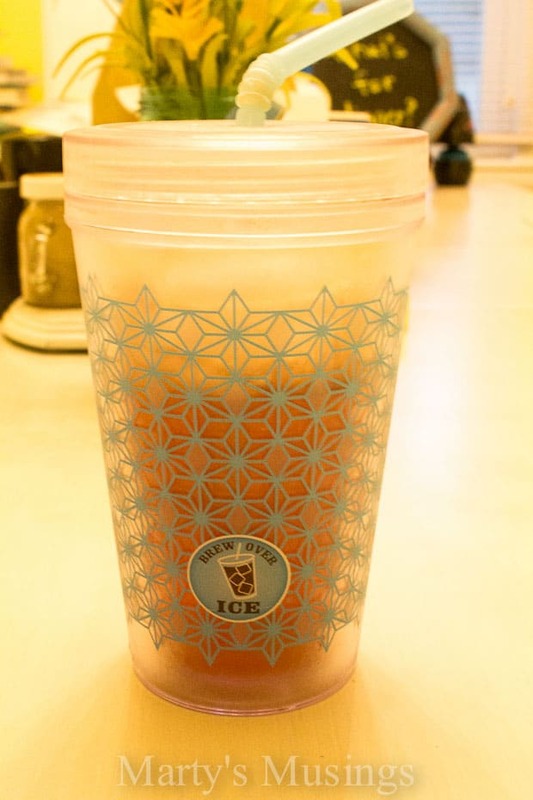 I am in love with iced tea kcups. I am not a coffee drinker but the iced tea has won me over. Snapple Lemon Iced Tea. Celestial Seasonings Southern Sweet Perfect Iced Tea. A glass of sweet tea at dinner is my incentive to make it through the day! Seriously, I love it that much. Tim and I have begun starting our mornings together while he has a mug (or maybe closer to a thermos) of his favorite kcup coffee. Usually the rule in the house is don’t talk to daddy until he’s had that cup of coffee. It’s a good rule. We’re practicing what it will look like when our youngest ones leave the nest. It’s a good thing! As a name devoted to excellence since the early 1990s, Keurig is the leading single cup brewing system in North America. The high-quality technology allows users to brew the perfect cup – every time. Choose from more than 250 gourmet varieties of coffee, tea and hot cocoa. With so many choices, there’s always something to make everyone happy. Brew. Place your K-Cup® pack in the brewer, lower the handle and select your favorite brew size. It’s as simple as that, ready in 60 seconds or less, and there’s never any grinding, measuring or clean up. Enjoy. Whether it’s a mug of hot coffee in the morning, a relaxing cup of afternoon tea or a refreshing iced beverage, one-cup brewing means it’s always fresh and delicious. Every cup. Every time. Go ahead, press snooze. With Keurig, it’s as fast as choosing your favorite K-cup pack, placing it inside the brewer and selecting your brew size. In less than a minute, you’ll have your beverage in hand and ready to enjoy. De-stress with less mess. Breakfast dishes, scattered toys and unmade beds. You already have too much to clean up this morning. Why add coffee filters, beans and leftover brew to the mix? Keep your kitchen clean and organized with a Keurig brewer. Brew the best. Why settle for an average cup of coffee, or waste time standing in line at a coffee shop, when you can make a great-tasting beverage in your own kitchen? Keurig K-Cup packs are designed to lock in freshness, so your coffee has the same rich aroma and flavor as freshly ground brew – just without the extra work. To increase awareness and sales in the Triad area, Keurig will host a series of sampling and brewer exchange events from August 22 – September 27. Trade Up to a Keurig Brewer” events: Experience the convenience of Keurig by dropping off your old drip coffee machine and exchanging it for a brand new, free Keurig single cup brewer. Events are open to participants 18 years of age or older with proof of North Carolina residence. Only non-Keurig, used, electric brewers are eligible for trade-in while supplies last. Sampling events: Test out the Keurig brewing system firsthand with a free sample of your favorite beverage. Mobile and stationary sampling events are open to the public, and Keurig pledges to give away nearly 75,000 free cups of premium beverages to event participants over the course of a month. 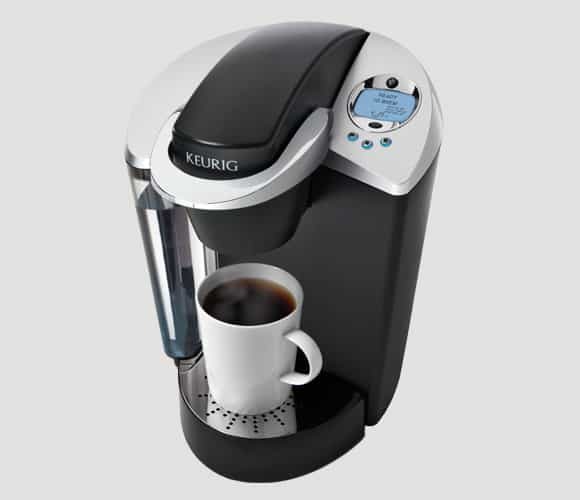 And since I love my readers so much I’m giving away one Keurig K-65 Special Edition Brewing System to one lucky reader. Must live in the United States to win. 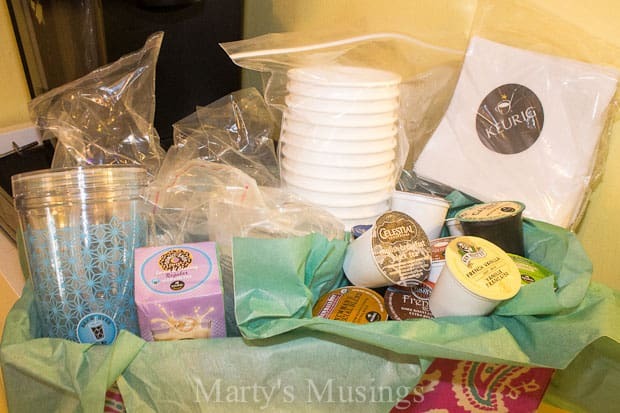 As a second prize I am giving away the lovely gift basket pictured below with a bunch of Keurig goodies inside. You do NOT have to live in NC to participate but you do have to live in the United States. 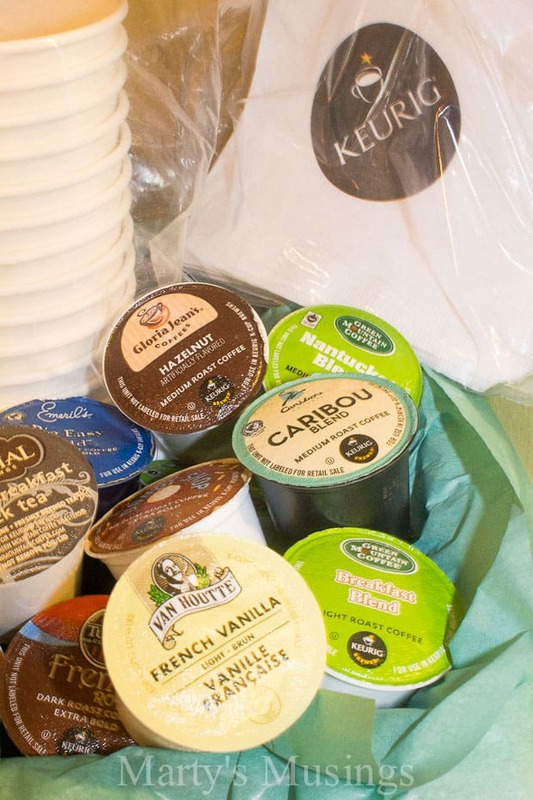 Disclosure: I was given product by Keurig for sharing my opinions, but the love of all things Keurig is all mine! Thanks for hosting a wonderful giveaway! As an ice tea drinker, that part sounds great! Brew 1 glass of iced tea, instead of a whole pitcher! Ours isn’t working right anymore, so we need a replacement, please!!!!!!!!!! !